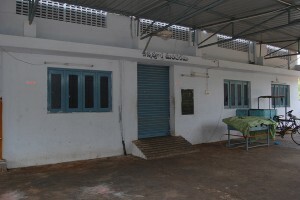 Gandigunta is a village, where agriculture is the main occupation. 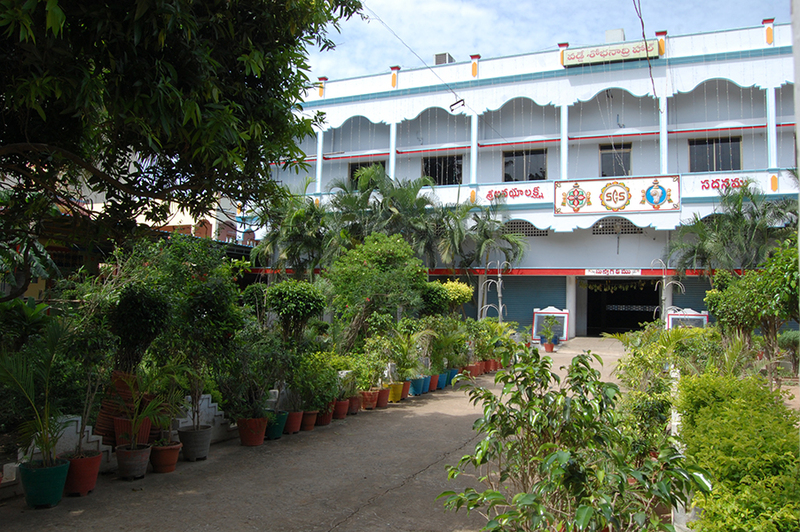 This village is situated on the road from Vijayawada to Machilipatnam at a distance of 20 kilometers from Vijayawada.His Holiness Sri Sri Sri Ganapati Sachchidananda Swamiji visited Gandigunta for the first time on 15th February 1988,upon the invitation of Sri Venkata Subba Rao Nadella. 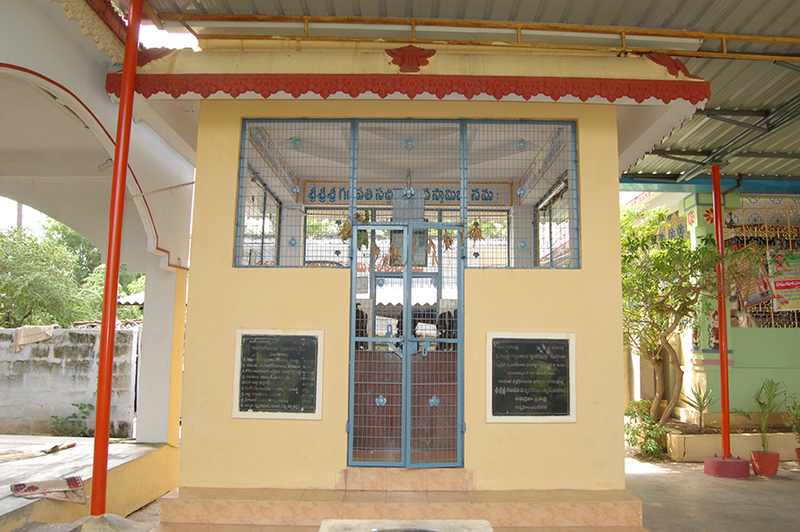 In the year 1989, His Holiness Sri Swamiji started the Ashram in Gandigunta and it was registered as Sri Ganapati Sachchidananda Gnana Bodha Sabha Trust. His Holiness Sri Ganapati Sachchidananda Swamiji an incarnation of lord Dattatreya took the divine determination to consecrate sixteen Dattatreya temples relating to the incarnations of Dattatreya. 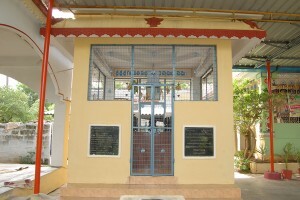 In that lineage the thirteenth Kshetram namely Anagha Devi Sametha (and ) Datta Digambara was consecrated in Gandigunta Ashram On 17th January 1991 in a spectacular way.Later on Jan 17 ,2004 , Sri Swamiji consecrated Navagraha Temple. 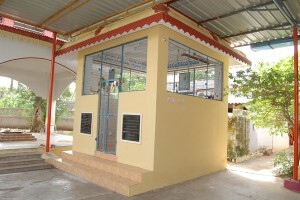 On 5th January 2003, Sri Swamiji inaugurated the newly built Sri Anagha Lakshmi Sadanamu (community hall) in the Ashram premises, for purposeful cause of spiritual, social and charitable activities conducted by the Gandigunta Ashram for the benefit of surrounding villages. 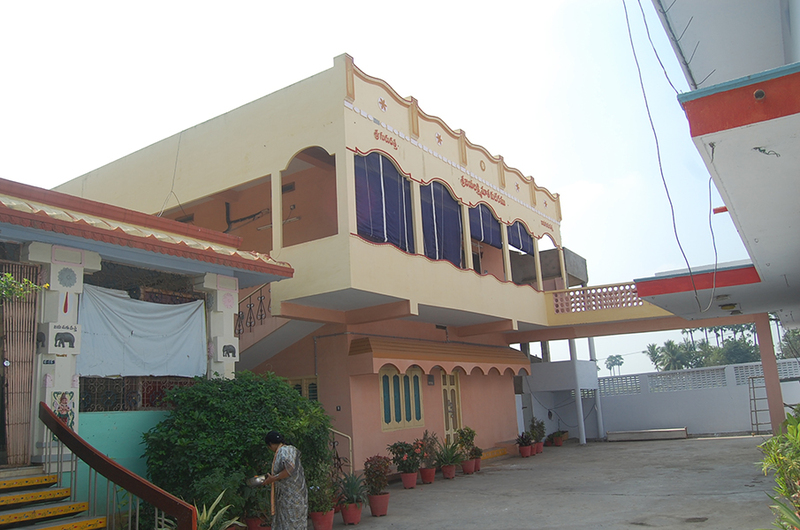 On 16th January 2009, Sri Swamiji Inaugurated of Sobhanadri Hall in the first floor of the community Hall. Jai means victory. Guru means spiritual master. 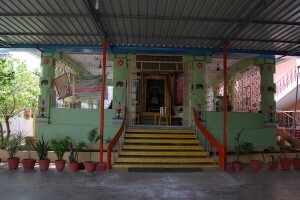 Datta implies atma-datta, or self surrender. When the devotee surrenders himself to the Guru, He is able to dispel the darkness of ignorance from the devotee and lead him to the realization of his own divine nature. “ajnana” (ignorance). That’s why He is sounding the “damaruga”. He’s saying, “You must come. You must come with me”. The “Shankh” is the same as “Omkara” (Primordial sound, the first word). “Omkara” is the first beat, the first “nada” (sound). 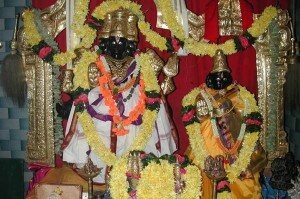 Akara, Ukara, Makara . “Akara”, the “A” means “srishti “ (creator). “Ukara” is “sthithi’ which means sustainer, protector. “Makara” means destroyer. A-U-M . The three sounds mix to make one sound, the “Omkara”. 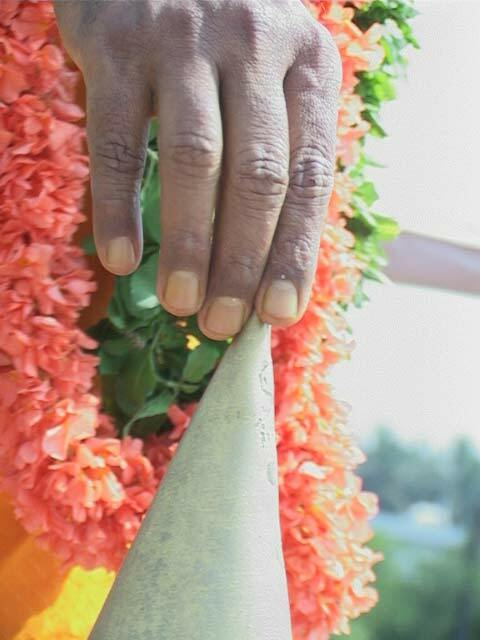 The “Omkara” sound is the “Shankhnada” Vishnu’s hands are always holding the “shankh” and the “chakra”. Your breathing itself is sounding “Omkara”. “So Hum”, I am the world, I am the universe. I am Shiva. I am Vishnu. You are always chanting this mantra with each breath. When the “shankh” sounds, the “avidya” (ignorance) lessens. Thus, Lord Vishnu is always sounding this “Shankh” in all human hearts and minds. In one hand Lord Vishnu holds the “chakra”. The “chakra” is the rotating karma; it is a round circle with no beginning and no end. Lord Vishnu takes this kind of Karma from all the souls. In Lord Dattatreya’s right hand He holds a “Japa mala” The Lord, Himself is always chanting the same mantra, Lord Shiva Himself is always meditating. Lord Dattatreya has a “mala”. Lord Shiva has a “mala”. Which mantra are they chanting? 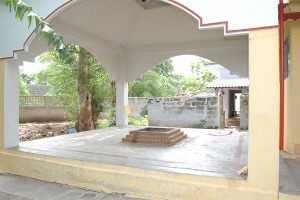 “Omkara”. “Omkara nada”. He Himself is suffering everyone’s karma. 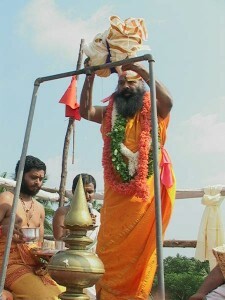 In one hand, Lord Dattatreya is carrying the “Kamandalu”, the water vessel, This is not ordinary water. It is the nectar of wisdom. Behind him is a cow, “Kamadhenu”. He is for people who are asking for worldly desires. He is always granting these. 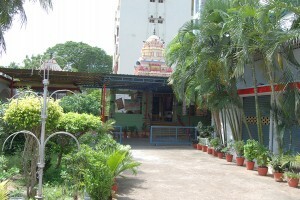 Then, the tree; it is “Kalpavrksha” , which means coconut tree. The coconut water is sweet, and there are many uses for a coconut. The four dogs are not ordinary dogs, but the four Vedas: Rg-Veda, Yajur-Veda, Sama-Veda, and Atharvana-Veda. 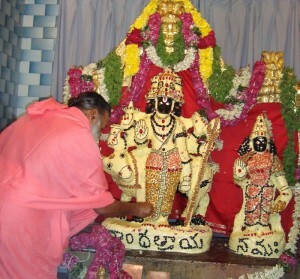 These four “dogs” are surrounding Lord Dattatreya. 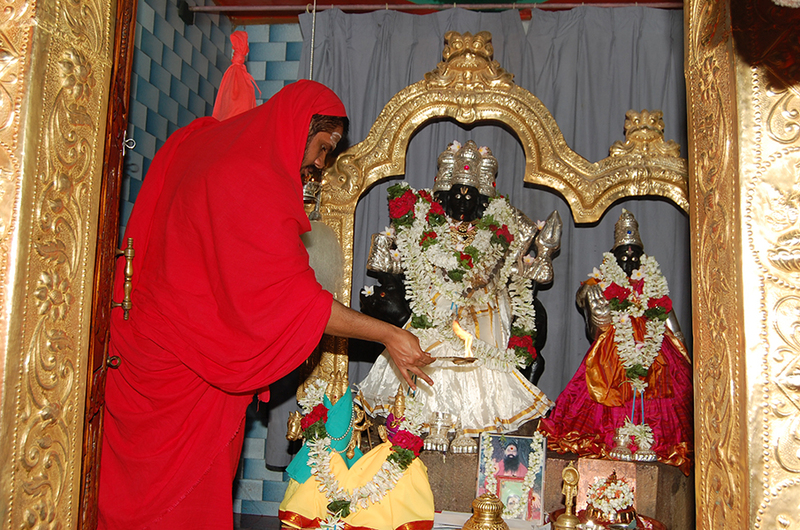 Avatar – Datta Digambara – Granted himself to sage Atri. Shodasa Datta Kshetrams ~ Ashrama – Shodasa Datta Kshetrams ~ 11 June 2015 from Puttu Gam on Vimeo. 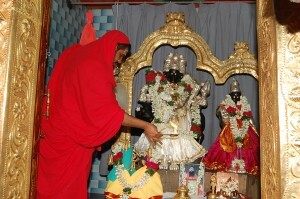 Lord Dattatreya took 16 Avatars (incarnation). One of the incarnation is Datta Digambara.Datta Digambara Avatar took place on Kartika Bahula Dwitiya, Friday, Mrug Nakshatra, at sunrise. Lord Vishnu appeared before Atri Maharshi as a boy on the Kartik Vadya 2, Mrug Nakshatra, Friday at sun-rise on the first muhurta. He looked bluish as Indranil in colour.His face was pleasant as the moon, his four hands possessed shankha, chakra, gada and padma.Vibhuti was applied on his body and he had locks of hair on his head. He appeared saying, “Dattoham”. Atri Maharshi and Anasuya Mata said, “We shall not be content till you take birth from us.” Being pleased with their speech, he entered in the heart of Atri as a spark of lightning and afterwards took birth as a son of Anasuya Mata. Anagha means sinless. In general we commit a number of sins by our deeds, words and thought. These sins prevent us from progressing. The Couple that destroys these types of sins are Anagha Swami and Anagha Devi, who protect the people in the world. Sadguru Lord Dattatreya’s Tattvam is beyond our comprehension. Although He is highly recognized as Avadhuta, many scholars are unaware of His householders role. Dattatreya takes many different forms to advance the His Tattvam. 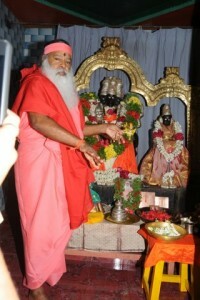 For the role he plays as householder,Dattatreya is known as Anagha Swami. His wife is known as Anagha Devi. In reality she is incarnation of Lakshmi Devi. By merging themselves in Samadhi state all the time, both husband and wife grant happiness, wisdom and knowledge to all the aspirants. His Holiness Sri Sri Sri Ganapathy Sachchindananda Swamiji is a great Vaggeyakaara (singer-composer) of the present times and credited with thousands of compositions in several languages. On one hand his tunes are simple and catchy (In Naama Sankeertana style); while on the other hand they are intricate and stimulate inner inquiry (e.g. 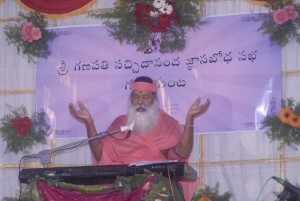 Tattva Bhajans). One of the Compositions on Datta Digambara Avatara.